Posted June 5, 2013, in News. 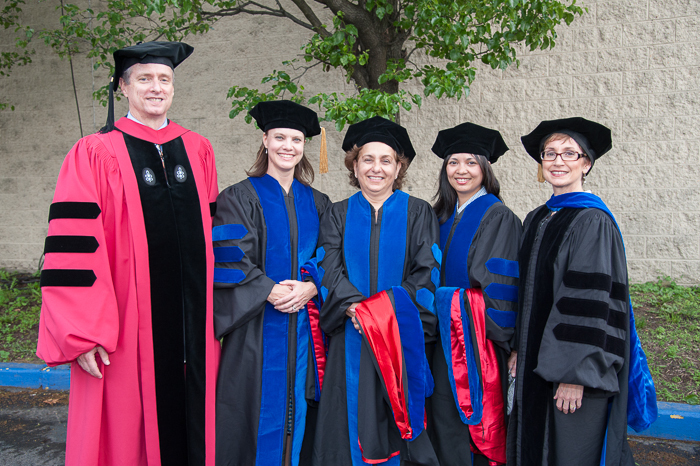 In May 2013, the Department graduated its first Ph.D. students—Marla Wander, Lara Saguisag and Deb Valentine. These “pioneers” of childhood studies represent the leading edge of an exciting and dynamic field. Marla’s research investigates the health decision making process among a adolescents, parents and physicians regarding optional vaccination for preventing HPV infections that cause adult cancers. Lara’s dissertation, “Drawing the Lines: Constructing Childhood in Progressive Era Kid Strips, 1896-1911,” examines representations of childhood in late nineteenth and early twentieth century comic strips. Deb’s historical study of the playgrounds in late 19th-earlty 20th century Philadelphia demonstrates that play advocacy had both positive and negative effects for children in particular communities and sheds new light on the importance of women and African Americans play and kindergarten movements. Lara will begin a tenure-track position as Assistant Professor in English at the City University of New York-College of Staten Island in Fall 2013. Marla will consult on adolescent health. In Fall 2013, Deb will be teaching in the Teacher Education Department at St. Joseph’s University. Childhood Studies PhD Graduates with their Advisors at May 2013 graduation. Page last updated by Department of Childhood Studies at 12:28 pm August 9, 2017 . This page was printed from http://childhood.camden.rutgers.edu/2013/06/05/childhood-studies-graduates-first-phds-in-the-field-in-north-america/ at 3:53 AM Friday, April 26, 2019.